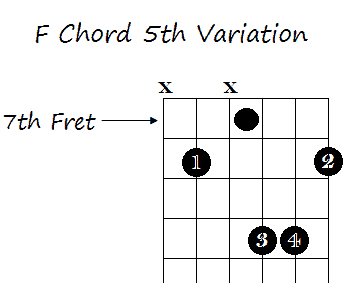 This post will show 5 different ways to play the F chord on guitar. Once you’ve mastered some of the basic chords on guitar it’s a good idea to start learning different chords – like 7th chords, sus4 chords etc. But another way you can expand your repertoire is learning how to play chords in different ways and in different positions on the fingerboard. Just to clarify, when I say F, I am referring to F major. Why Learn the Same Chord Different Ways? Being able to play the same chord adds richness to your playing and each different way you play the F chord, will have a slightly different sound to it. It can also mean that you are able to transition to an F chord in a different position on the fingerboard more easily if you are playing some other chords in that position on the fingerboard – or if you are playing leads. If you can easily find an F chord (and other chords but this post is going to focus on the F chord) in a few different positions, then your improvisation, song writing, lead work and just general playing will be enhanced. If you aren’t yet sure about how to play chords check out the link below first to get some basics under your belt before returning to this post. If you aren’t sure about how to read the chord charts below also check out that link. This is probably the most known of all the F chords (except maybe the F barre chord). 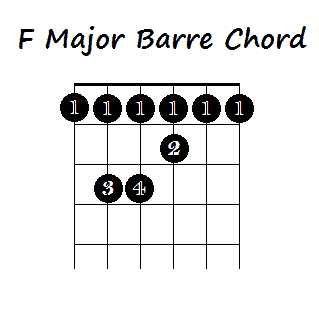 The Barre F chord can be played in a couple of different positions. I’m going to show the two most common barre positions here. I’m showing it as one version of the chord, though technically there are two here – but they are very easy so you get 2 for 1 here! 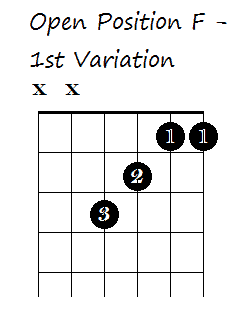 The first F barre chord starts on the 1st fret. All of the strings of the 1st fret are barred with your index finger. And then the open E shape is played in the 3rd fret with your remaining fingers – just like all major barre chords that start on the Low E string. 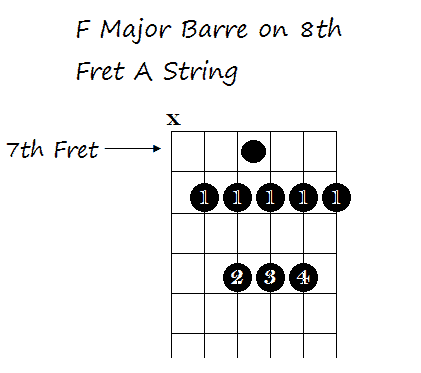 This is the A string F barre chord. For this chord you barre all of the strings from the A string down in the 8th fret. An open A chord shape is made in the 10th fret with your remaining fingers. How you make this A shape is up to what you find easiest. Personally I find it difficult to fit all three fingers into the 10th fret – so I play it by barring the D, G, and B strings in the 10th fret with my 3rd finger (ring finger). But you might want to use your 2nd finger on the D string 10th fret, your 3rd finger on the G string 10th fret and you 4th finger on the B string 10th fret – if you can fit them in and that’s your preferred method. Experiment with both to see which works best for you. O.k. 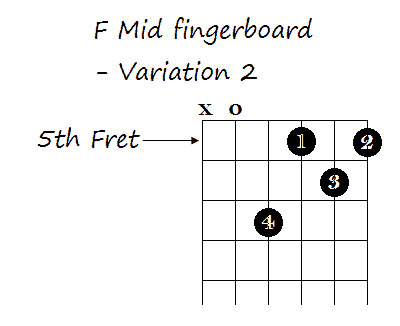 the first two ways of playing the F chord above are the most common ways, and you may well already know them – so now let’s get into the more interesting variations. 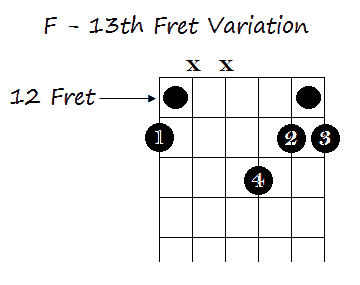 Whilst the 2nd version of the F barre chord (in the 8th fret) utilizes a position further down the neck, the others both start in the 1st fret. You may not want to go back there if we need to find an F chord quickly. Also, Barre chords can become stale if you are playing them all the time and you might want a different sounding F chord. Barre chords use all of the strings. Playing select strings and utilizing open strings whilst playing up the fingerboard can add richness, clarity and flavor to your chords. O.k. here’s the third variation. The best way to play this chord (IMHO) is by using your thumb of your right hand to pluck the Low E string and the 1st, 2nd and 3rd fingers of your right hand to pluck the G, B, and High E strings. You can also strum this chord but just make sure that your 1st finger is muting the A and D strings. This a good mid fingerboard option. And there are few variations you can experiment with. To add a different flavor you could also play this with an A bass note. This would be played. You could either play this by strumming the D, G, B and E strings, by plucking the D, G, B and E strings with your thumb and fingers on your strumming hand or you could even add in another A in the bass by strumming the open A string in addition to the others. 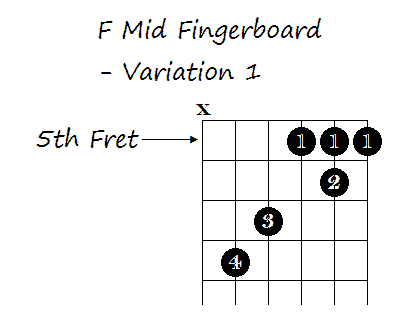 Finally let’s take a look at an F that’s in between the 3rd and 4th variation above – in terms of location on the fingerboard. 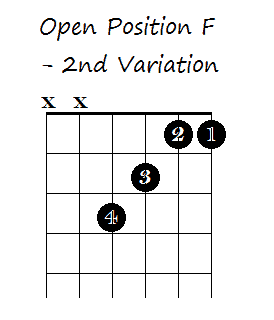 This variation is an alternative to using the 2nd version of the F barre chord (see above). It uses the same notes but you don’t have to Barre and you’re more selective in the notes that you strum or pluck. I prefer this way at times, just because it doesn’t sound as muddled as barre chords can sometimes sound – there’s a better clarity to the chord. Pluck the A string with your thumb of your strumming hand and the G, B, and E strings with the 1st, 2nd and 3rd fingers of your strumming hand. Or strum from the A string down, making sure to mute the D string with your 1st finger. I hope this post has given you some options for playing the F major chord in ways that you haven’t played it before and that you can incorporate in your playing. Are there any other ways that you play F? I’d love to hear of other ways people like to play F. Just leave a comment in the comments secion below.